E: The BAFTAs, which took place Sunday night, cleared up very little about the Oscar race. Like everyone else, the British Academy of Film and Television Arts split the different; Alfonso Cuaron for director, Gravity for Best British film, and 12 Years a Slave for overall Best Picture. At this point we need to give up on the idea that there is clarity to be had out there, that the race will ever coalesce into support for a single frontrunner. Oscar doesn’t generally roll this way, but this year a mismatch between picture and director is the safest bet. Dallas Buyers Club didn’t play well in England, somehow; frontrunners Matthew McConaughey and Jared Leto weren’t nominated and so didn’t factor into the wins. Their places were taken by the wonderful Chiwetel Ejiofor and amazing newbie Barkhad Abdi. McConaughey was amazing in DBC, but I do not regret missing one of his self-satisfied, rambling speeches; Ejiofor, by contrast, was humble and charming. Instead of cementing Lupita Nyong’o’s place as the frontrunner, however, BAFTA picked Golden Globe winner Jennifer Lawrence instead. This muddies the waters, but not too badly – BAFTA picked Emmanuelle Riva last year instead of Lawrence, so this might be a bit of an apology. It’s very unusual for Oscar to reward someone two years in a row; Lawrence would also be the youngest ever actor to win two Oscars, and that might factor in the Academy’s thinking as well. Still, the BAFTA and AAMPAS memberships are so linked that we have to take this win under serious consideration. I couldn’t help but note, finally, that Best Actress winner Cate Blanchett has found away around her acceptance speech dilemma. I’m not implying that it’s a cynical move at all – I’m sure she was genuinely shocked and saddened by her old costar’s passing – but it’s a very very smart one. C: When Frozen opened in theaters I wanted to go see it, but thanks to a busy Thanksgiving and Christmas season, I missed my chance — or so I thought. Two weeks ago, I searched online to see if it had come to the late-run theater in the city. With amazement, I saw there were still plenty of showings at the local cineplex. From this, you can probably deduce that my social world is mostly made up of childless young professional types. Before this moment, the Frozen Phenomenon — its immense popularity with children, teens, and parents — was scarcely a blip on my radar, minus a stray post here and there on social media. But I was soon to learn much more. I dragged a roommate out to see the movie, and I loved it. I loved the whole soundtrack, the story, the visuals (other than the admittedly disturbing proportions of the male and female protagonists), and especially that thing everyone’s been talking about, the cool fact that Disney finally* made a movie about a positive relationship between females. All three songs are sentimental, with soaring vocals and haunting key changes. But while the older two are sad, “Let It Go” is rousing and empowering. At least, that’s the effect it has, right? Isn’t that why thousands of people, mostly young girls, have learned all the words and recorded their own renditions? It encapsulates a fantasy so intense many older viewers may not have allowed it up to the surface for years. 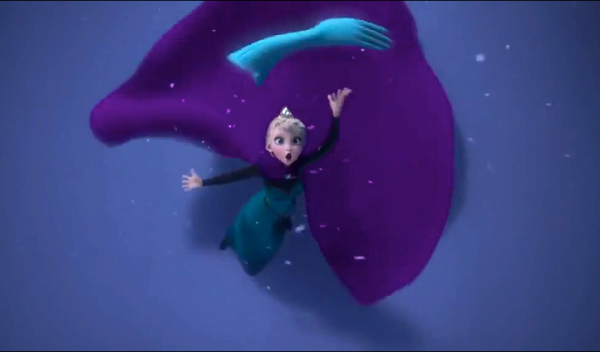 The moment when Elsa pulls off the gloves she’s worn ever since her magical ice powers almost killed her little sister and belts out the chorus for the first time — let it go, let it go, can’t hold it back anymore — seems to resonate with everyone who’s felt the need to repress a part of themselves that wasn’t accepted, and evokes the transformative bliss of not hiding anymore. Have you paid attention to the next line, though? “No right, no wrong, no rules for me. I’m not saying we shouldn’t love “Let It Go” — that would be hypocritical. (Hang on while I go Youtube that cool “Africanized” version again.) I am saying, though, that the comments one hears from all sides about how this song speaks to personal experiences from coming out of the closet to cancer survival ought to be food for thought, and for conversation. Goodness knows I don’t want to take anything away from a person who feels encouraged by this song to be themselves, publicly and honestly. But let’s just, for a moment, ponder the fact that this was written as a villain’s origin story. What does it mean to really let everything go? Do we really think “no right, no wrong, no rules for me” is an ideal expression of fulfillment and self-worth? Do we consider the fact that for Elsa to fully liberate herself in this scene, she has to turn her back on the country that she is in fact ruler of? “I’m never going back, the past is in the past” isn’t metaphorical. She means it. Essentially, what is lost in singling out “Let It Go” from its context, making it a viral empowerment sensation in its own right, is the entire message of the movie: Elsa should not let everything go. She is being fearful, and she is being selfish. Elsa has to go back and face the people whose very existence constricts what she can do. She can’t just “let the storm rage on.” She can’t live in that kickass ice palace, not if she’s going to be Queen — she has to settle for a frozen courtyard. But she makes it work, because what actually matters to her is the relationships in her life. They were stunted while she was shut in her miserable palace bedroom — but they were nonexistent when she was in exile. She had to show others the truth about her, but she also had to take their needs into account. And if she hadn’t accepted the limits imposed by considering others’ needs, she would’ve missed out on one whole aspect of her powers, the key to wielding her gift with control and purpose. Empowerment, the writers of Frozen understand, has to be in service of a stronger, better, more truly vibrant community, or it’s about as meaningful as the rulership of an unpopulated mountain. What “Let It Go” is, is a beautiful song about the very human longing for self-expression without consequences. What “Let It Go” isn’t… is the full arc of a heroine’s origin story. E: Following the Oscars means I end up watching movies I don’t want to watch. Sometimes this is an unexpectedly beautiful gift, a window of empathy into a new corner of the human experience I hadn’t experienced before. Those are the days when I’m really glad that I do follow the awards season. And then there’s a movie like this one, which I would never have validated with my viewership otherwise. All season I’ve been dreading the Jordan Belfort biopic The Wolf of Wall Street, that firestorm of controversy, a film rumored to laud one of the thoughtless Master of the Universe who helped wreck our economy, using and abusing drugs and women every step of the way. But because I make the effort even when I don’t want to, I saw TWoWS. And here’s the thing about this movie. It’s actually laugh out loud funny. The men in it are so extravagantly vile, such complete clowns that you can’t help but guffaw at the stuff they did. It’s like the Three Stooges poking each other in the eye, Wile E. Coyote dropping TNT on the Roadrunner and blowing himself up instead; what you see is the absurdity. E: I’ve said it before; I love me some pageantry. On the other hand, I’m a child of the Cold War. I actually visited Soviet Russia as a teen during the beginnings of Glastnost, and as a young adult, I saw the system fall. I’ve seen the specter of it rise again in former KGB goon Vladimir Putin. M: Hey, hey, hey. We’re relatively anonymous on here (pun intended), but watch what you say: Putin’s reach is far and wide. I don’t want you getting poisoned like a Ukrainian political leader or anything. E: Thanks, bro, although I’m sure Mr. Putin has a lot more on his mind than being unappreciated by one American. But back to my point: I love ballet and can appreciate a country with such fervor for the arts. And yet, obviously, I’ve seen the same Sochi Fail posts as everyone else. C: So E, what you’re saying, I think, is that you have mixed feelings about Sochi and everything these games represent for Russia? M: You want to hear something good to start a monthly preview? I actually like the look of a lot of the movies this month! E: Wait, what did you say? M: I know, unexpected, right? We often rail about the lack of quality releases in all but a few month of the year, and February is often one of the worst (go back and look at the start of last year’s February preview for some details). I’m wondering if last year’s “surprise hit” Warm Bodies may have warmed up the way executives look at February. C: I mean, you have to think at this point there’s room for a few good movies to take the place of the Christmas ones leaving theaters. They’d be foolish not to give us at least a few good kid flicks and romcoms. E: Leaving aside the fact that most people would probably want good movie options all year long, yes — with school vacations and Valentine’s Day, there’s room for good movies to become really big hits. M: Even better — there’s stuff I want to see, too. E: What’s an overwhelming Oscar front runner to do when the writer/director she’s praised extravagantly might just be the slime of the earth? If you know me, you know I’m all about trying to be fair. And that I spend a lot of time dissecting problems that I can’t solve. And that I don’t just love the Oscars, I have pretty strong opinions about acceptance speeches. And that I think Cate Blanchett is all that’s best in acting. But as I do spend my time thinking and writing about the Oscars, I’d like to share some thoughts the film, Blanchett’s role, and her role in the larger discussion. What does it mean for this year’s race to talk about this now, to grapple with such pain and confusion?